On 31st January 1912, Henry Eustace Mitton of the Butterley Co took Thomas Henry Adams as an articled apprentice, to learn the job as a Colliery Viewer, at the sum of £100 per year. A detailed document laying down all kinds of rules etc was duly signed by both and witnessed by another. 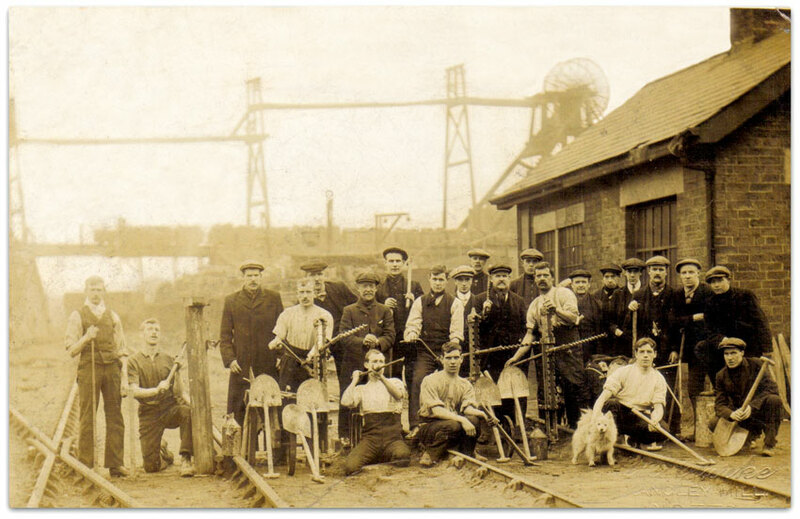 There was a strike at Bentinck (Nottinghamshire) (New Hucknall Colliery Co) in February 1912, again over minimum rates. The union allowed the winders, firemen, datallers and ostlers to carry on working to keep the roads open, but no coal was to be produced. Derbyshire miners had voted 17,999 for a strike and 6,816 against. Nottinghamshire miners voted 17,086 in favour with 5,386 against. Nationally the vote was 445,801 for with 115,921 against. The strike had been caused by the inability to establish a minimum wage at national or local level. During the stoppage the miners used to chant . . . However the settlement fell well short of the miners’ demands but the strike had brought in minimum rates for all workers. 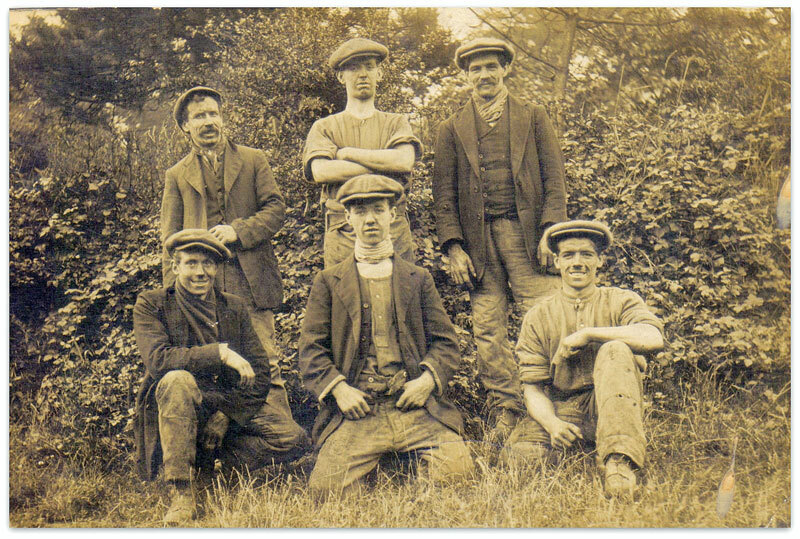 On 29th March 1912 the Coal Mines (Minimum Wage) Act was passed which guaranteed 6s 6d a day (32½p), however this did not apply to anyone above 65 years of age. It came into force from 25th June 1912. However the minimum rate paid in Nottinghamshire was 7s 3d (36¼p). 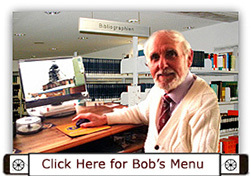 Subject to % addition of 20%. Men aged 22 and over were paid the 1888 basis, i. e. 3s 4d (16½p) plus 50%. other Stokers 5s 2d (25¾p). North Derbyshire 8,080 voted to return to work with 13,428 voting against. Nottinghamshire 8,187 voted to return with 8,213 against. South Derbyshire 1,626 voted to return with 1,090 against. Great Britain as a whole, 201,013 voted for resumption and 244,011 against. 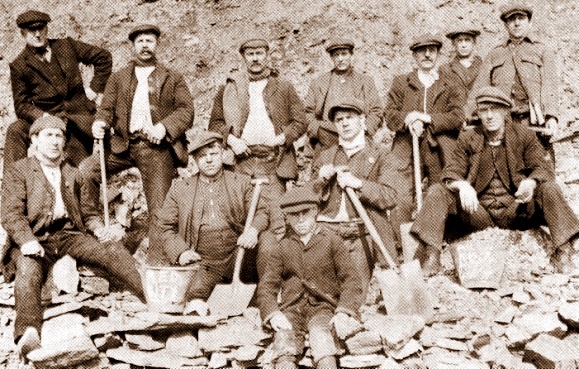 Following the strike some Derbyshire pits were ‘solid’ and could not be worked for many weeks. Some owners refused to employ older men, saying they could not afford to pay the minimum wage rates. The price of coal was raised, up to £2 a ton in London. On 27th April 1912 there was an explosion at Holbrook (J and G Wells) and 2 men were killed. Work started on preparing to sink Clipstone in 1912 when more than 5,000 acres of land was leased from the Duke of Portland by the Bolsover Company. Worthington Colliery and Pipe Co Ltd sold Worthington (Staunton), (South Derbyshire) to Hardy and Co, tile and pipe merchants. 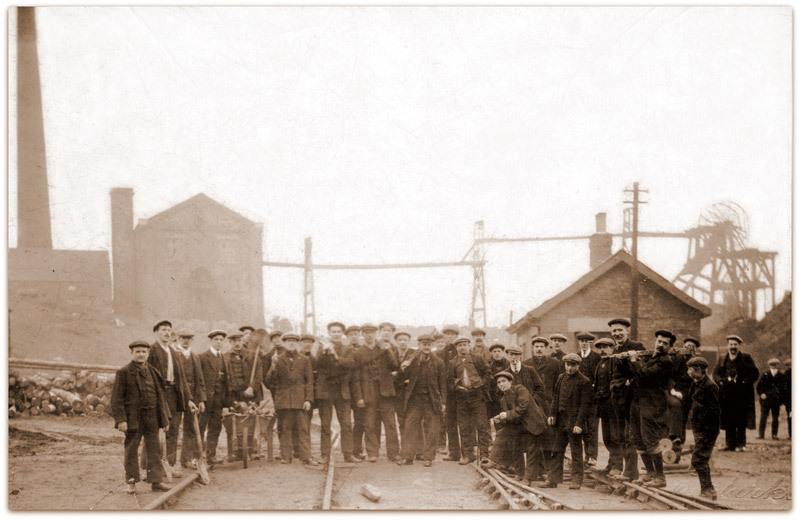 At Sutton (Nottinghamshire) (Blackwell Colliery Co Ltd) in June 1912 there were 87 men in Top Hard, 34 in Dunsil, 190 in Deep Hard and 407 in Low Main or Tupton, with 191 surface men, whereas by 1913 there were only 67 in the Deep Hard and Dunsil and 416 in the Tupton. Blackwell Colliery Co was working Low Main under a sub-lease from Pinxton Collieries Ltd. 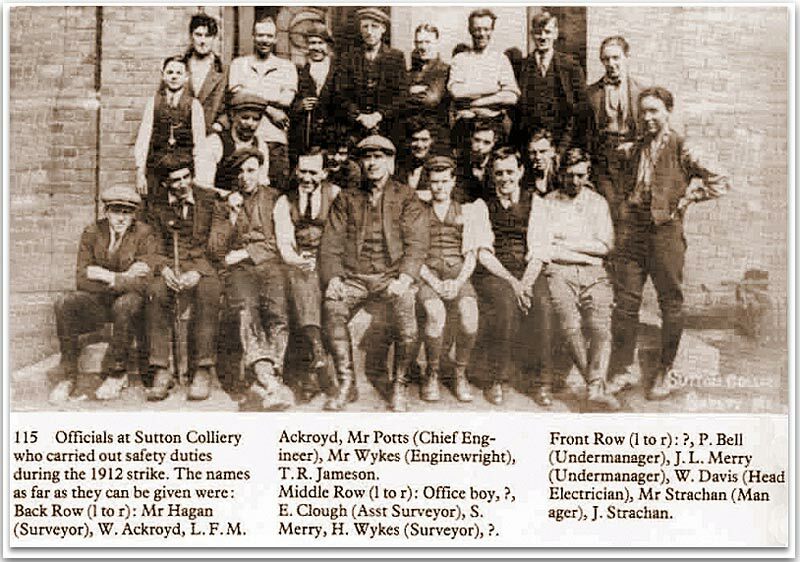 Above in the photo are the management personnel for the Blackwell Colliery Co who performed safety duties during the 1912 strike. On 9th July 1912 Inspectors William Henry Pickering (53), Henry Richardson Hewitt (45) and Gilbert Young Tickle (34) were tragically killed at Cadeby Main, (Yorkshire) (Manager Charles Berry) in one of the two explosions occurring at 1. 30am and 11am. Total fatalities were 88 men and boys including 2 Managers, an Undermanager, the Surveyor and a student plus several other under-officials. (Throughout the country there were 20 explosions in the 3,265 mines, causing 124 fatalities). On 28th July 1912 Thomas H Mottram was appointed Chief Inspector for the District. PJ Fenwick Manager of Pleasley stated that the candles that were used at the coal face for illumination were being held too far away from the work, and causing nystagmus, and on medical advice should be shaded with air reflectors painted white on the inside. By the end of 1912, Watnall (Nottinghamshire) (Barber, Walker and Co), the only Top Hard pit in the Eastwood area was only producing around 300 tons a day and the Coombe coal which lies just above it was opened out to replace it. There was a further advance of 5% in wage rates in December 1912. Ambergate (E Glossop) Bull Bridge, re-opening. Gun Lane (J and E Shore) Nether Heage, Norton. Hartington (Staveley Coal and Iron Co) Blackshale re-opening. Low Moor (Kirkby) (Butterley Co Ltd) sinking. North Wingfield (North Wingfield Colliery Co) Deep Soft. Ollersett Hall (Ollersett Collieries Ltd) re-opening, Mountain. Rufford (Bolsover Colliery Co) sinking. Unstone Silkstone (Hawkins and Jackson) new opening. Welbeck (Nottinghamshire) (New Hucknall Colliery Co) sinking. Walton (Walton Colliery Co) Chesterfield, Piper. Alma No2 and No4 (Alma Colliery Co Ltd) N Wingfield. Blackwell B No3 (Blackwell Colliery Co) Waterloo stood. Broadfields (Broadfields Colliery Co) Horsley Woodhouse, 8 Mickley, 9 s/f, Surveyor RB Ireland. Chew Wood (Glossop Vale Ganister Co Ltd), ganister 13” (0. 33m) + 3” (0. 08m) stone), Cross and Sons, Ashworth and Morris. Denby Hall Rough Close (Butterley Co Ltd) Deep Hard, Low Main. Digby (Digby Colliery Co Ltd) Deep Soft 2’ 9” (0. 84m) + 10” (0. 25m) bats, 11/1912, Surveyor John Rigby. Grasscroft (Grasscroft Colliery Ltd), Dronfield, Blackshale, worked 1907 app – 1912. Ilkeston (Ilkeston Colliery Co Ltd) 400 Kilburn, 106 s/f, Manager: B Nightingale (1267), Undermanager: John J Blood (4345 / 2nd) closed after 36 years. Kilburn Hall (Parkin, Bell and Co) Ashgate 2’ 11” (0. 28m), poor quality, near surface. Mapperley 1 (Mapperley Colliery Co) Piper stood 1909. Oakwell (Ilkeston Colliery Co) Kilburn, DC 232 yards (212m), UC 228 yards 2 feet (209m), Dec 1912, Manager FJ Durance, Surveyor MR Coxon (qual). Pinxton No6 (Pinxton Collieries Ltd) Deep Soft 113 yards (103m) 43/nil, Surveyor EA Hughes (830). Plumptre (Butterley Co) Deep Hard and Main Soft abandoned 30 Apr 1912, Surveyor John Holbrook (service cert), Agent H Eustace Mitton (no cert). Holly Bush pit 35 yards (32m). Renishaw Park 1 and 2 (J and G Wells), Eckington stood. Ripley (Butterley Co Ltd) Ell and Blackrake ironstone, Soft coal and Hard coal unprofitable, John Holbrook Surveyor, H Eustace Mitton Agent, No1 shaft 163 yards (149m) to Deep Soft, 192 yards (175. 5m), pit top 474 feet (144. 5m) above sea level, No3 shaft 209 yards (191m) to Piper, 256½ yards (234. 5m) to Low Main, 295⅔ yards (270. 3m) to Blackshale. Ryefield (Bourne and Sons) Denby, Deep Soft. Shady Hall (William Horrox) Marsh Lane, Silkstone 11/3. Mosbro’ Hall or Streetfield (J Worrall), Eckington, Deep Hard or Parkgate, 15 Oct 1912, DC shaft 20 yards (18. 25m) and UC 17 yards (15m), app 228½ yards (250m) between them, Surveyor J Fletcher Archer MA, MIME (853). Top Drift (Derby Kilburn Colliery Co Ltd) Stanley. Whiteley (Butterley Co), Silkstone stood 1911. Wingfield Manor (Wingfield Manor Colliery Co Ltd) Silkstone stood since 1908. Robin Hood (His Grace Duke of Devonshire), Baslow, 5/1, Baslow coal, Apr. Birchen Lea (T Kyme and Son), Dronfield Woodhouse. Rectory (William Ogle and Jos Cockayne) Heage, Kilburn: coal batts 11” (0. 28m), coal 2’ 6” (0. 76m), batts 6” (0. 15m), coal no use 10” (0. 25m), old workings met. The photos show a group of 35 men at the colliery. They are looking fairly happy whilst posing and probably as the mine had just closed they had a job to go to at another mine nearby. Plumptre (Butterley Iron and Coal Co) Eastwood (Nottinghamshire) sunk in 1850 to 220 yards (201m) and 223 yards (204m) deep to Deep Hard seam, was abandoned in 1912. It was 206 yards (188.3m) to the 3' 6" (1.07m) Main Soft (or Deep Soft seam). The Deep Hard seam section was shown as Jay 10" (0.25m), Scud 6" (0.15m), Deep Hard coal 2' 6" (0.76m), Total 4' 0" (1.22m) extraction. The pit was sometimes referred to as Plumptree, Plumtree and also known as New England. These were misnomers as it was named after the Rev’d Plumptre an incumbent at Eastwood. It was situated not far from Eastwood Hall, Shaft positions E446183, N347976, E4461132 N348037. There were 3 sets of stables in the pit bottom. Coal was ganged in tubs to the pit bottom by ponies led by young boys. The benk faces were about 80 yards (73m) long accessed by one gate. A pillar was left for the Great Northern station at Eastwood. Originally the ventilation was effected by an underground furnace in the pit bottom near to and connected to the UC shaft before a fan was installed. A Water level roadway is shown passing through the pit bottom. The surveys were done by dial using the magnetic meridian and was adjusted periodically. Adjacent workings from Barber Walker and Co were surveyed by John R Hewett and John Holbrook in 1876. Probably Holbrook had not joined the Butterley Co as their Chief Surveyor at that time. Total depth 231 yards 1 foot 11 inches This was agreed by John Holbrook and H Eustace Mitton on 6 June 1912 and it was stated that the copy was to be kept by the Butterley Co Ltd. However there does appear to be a discrepancy in this section as on the abandonment plan it states that the shaft depths to the Deep Hard seam are 220 yards and 223 yards respectively. Possibly when the section was measured in 1857 I note that many of the strata measurements are round numbers and continually adding these together would lead to a longer length. There does not appear to be an end column giving running depths, which is the way to avoid any discrepancies and is the usual practice. Seams worked: Deep Soft and Deep Hard. From the Abandonment plan signed by John Holbrook Surveyor to the Butterley Co Ltd and countersigned by Henry Eustace Mitton as Mining Agent the following quantities of coal was recorded. Quantity of coal worked from commencement to Michaelmas 1868 was 17 acres 1 rod and 8 poles or perches which at £75 per acre raised £1,297 10s 0d in lease payment for the owner His Grace the Duke of Newcastle. Surveys at the time were carried out by George H Bond & Son Mining Engineers of Nottingham. The pit was leased by the Butterley Co Ltd, colliery offices at Codner Park, nr Alfreton, Derbyshire. Total amount worked to Michaelmas 1877 was 43 acres 2 rods 3 poles realising £3,263 18s 1d. From Michaelmas 1877 to Lady Day 1882 total was 54 acres 1 rod 23 poles realising a total of £4,079 10s 6½d in lease payments. The bottom photo shows the men with their tools, shovels, drills etc which they had to purchase so they were taking them home with them.. To the left written on 2 shovels is 6s and to the right 2 shovels with 10s. These were the last two districts worked. 1912: 256 DS, DH, 45 s/f. Both seams were abandoned and the mine was closed as deemed unprofitable on 30 April /1912 after 62 years. Humphrey R Watson (2333) 1891-1912. Jas Walker (service cert 973) pre 1887-1912. There were many small mines started about 1910/12 but were closed by 1914. If you look closely No 6 is chalked on a couple of shovels to the left and 10s on the ones to the right. These were panel or district numbers and probably were the last faces worked.